My heart breaks for the families who lost their loved ones. If the FBI had been doing what they are paid to do, and truly investigated Nikolas Cruz, perhaps the victims of this horrific shooting would still be with us today. It is coming out that this troubled teen was expelled from his school and was told that he was not allowed on the school property with a back pack. Sources are also saying that Cruz was an ISIS sympathizer; followed CAIR on his FB, and also proudly displayed pictures of his many guns on his FB page. This goes beyond tragic. This is criminal. Many top officials of our Federal Bureau of Investigation would rather be spying on a political candidate than thoroughly investigating a person who displayed all the signs of a mass shooter. Now, 17 people have lost their lives. 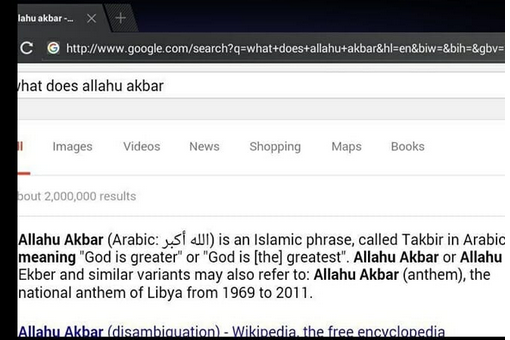 The mass murderer was immersed in Islamic and leftwing hate. Nicolas Cruz has been arrested after opening fire on a Florida high school on Ash Wednesday, leaving as many as 17 dead and up to 50 injured. According to a former math teacher of Cruz at the school, he had been previously identified as a security threat and had been informed last year that he wouldn’t be allowed on campus with a backpack. 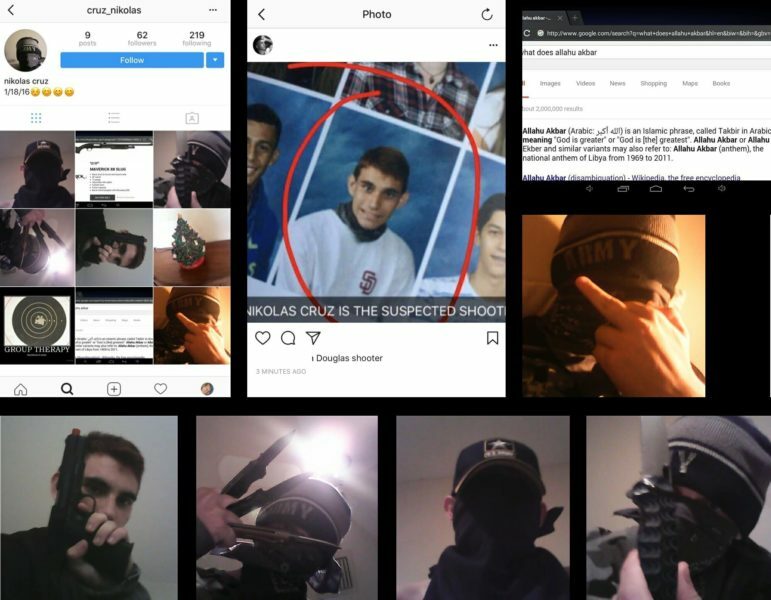 Here are some screenshots from his social media pages. Scroll down for video. An Instagram page belonging to Cruz showed pictures of guns and knives. FOX News: The suspected gunman arrested in connection with Wednesday’s shooting at a Florida high school was identified as Nicolas Cruz, a U.S. official told The Associated Press. Local media reported he was an 18-year-old former student of Marjory Stoneman Douglas High School in Parkland, north of Miami. While some teachers said he demonstrated warning signs, Superintendent Robert Runcie said he was not aware of any specific warnings the school district had received regarding the shooter. 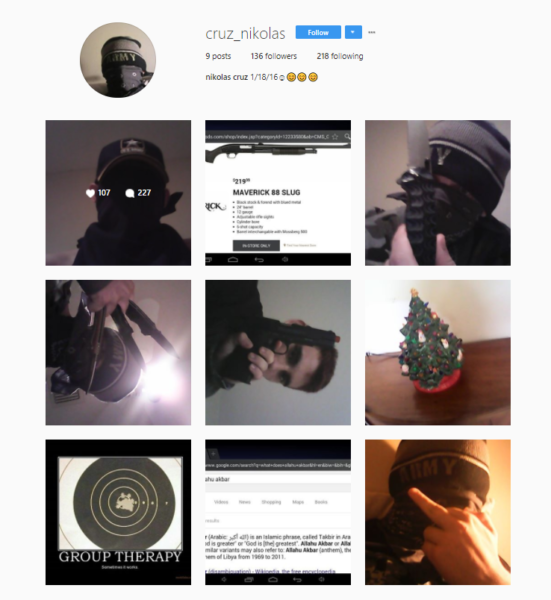 An Instagram page apparently belonging to Cruz showed pictures of guns and knives. One student told WJXT that “everyone predicted” the shooting, which killed multiple people, according to police. “It turns out, everyone predicted it,” the student said, adding the suspect knew the layout of the school. Sheriff Scott Israel said he didn’t know why the student left the school, as he was not currently enrolled. A teacher at the high school told the Miami Herald the suspect was seen as a potential threat in the past, as he allegedly threatened students last year. I did not post the graphic video out of respect for the families of the deceased. I am praying for these families as I am sure most of us are. I can’t imagine the agony they must be experiencing. I pray that many will turn to our Lord Jesus at this time and be saved. This could have been avoided if our FBI would have done their job! Geri, it’s heartbreaking what happened everybody in the media is talking about mental health issue when it’s a sin issue. I prayed for the victims and I don’t know if there where Brothers and Sisters in Christ there yesterday to comfort and minister to the victim but I know God was there. This should drive every unbeliever to their knees and recieve Jesus Christ as their Savior and Lord. It was a sad day yesterday. This world is sick with sin. Yes, this world IS sick with sin. But that word (sin) sends an unbeliever into a tail spin. It’s always someones fault or stricter gun laws need to be instated. But those who hate Christianity will NEVER admit that we are sinful beings. I have listened to Fox News not one mention of sin or heaven, hell the Gospel or that the victims need Jesus Christ. It’s just plain insane no one on Fox News said those things it was and is why did he do he did it because he’s a sinner in need of a Savior. What about Romans 10:20 or Jeremiah 17:9-10 Sorry for the rant. I have to be honest I couldn’t help but weep for those victims and I think lost ones. 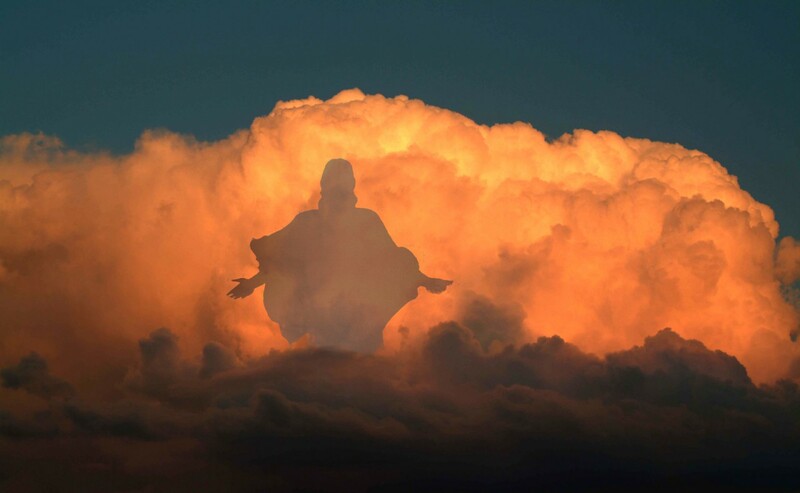 If those who died didn’t know Jesus as there Savior and Lord they are in but if they did Know Jesus as there their Savior and Lord they are in heaven with Him agree? I heard about this and it is very Heartbreaking!! Yes , WE NEED CHRIST JESUS-YESHUA in our Christian Nation USA AGAIN!! Please PRAY too our ONE TRUE GOD the FATHER who art in HEAVEN ABOVE and HIS SON Jesus-Yeshua Christ, for All our Sisters and Brothers in Christ Jesus-Yeshua and our Messianic Jewish Sisters and Brothers in Christ Jesus-Yeshua and Our Devout Jewish Sisters and Brothers EVERYDAY!! May our ONE TRUE GOD the FATHER who art in HEAVEN ABOVE Bless ALL my Sisters and Brothers in Christ Jesus-Yeshua and my Messianic Jewish Sisters and Brothers in Christ Jesus-Yeshua and my Devout Jewish Sisters and Brothers WHO STAND with the HOLY LAND of ISRAEL-YISRAEL and Our JUDEO-CHRISTIAN Nation UNITED STATES of AMERICA!! Our ONE TRUE GOD the FATHER and HIS LOVE ❤ is ETERNAL through HIS ONE and Only SON CHRIST JESUS-YESHUA for Today and Everyday Forevermore! !